From June 23-27, thirty-five monastics from 23 monasteries and Dharma centers, representing Theravada, Mahayana, and Vajrayana traditions originating from Asian countries such as Thailand, Burma, China, Japan, Vietnam, and Tibet, convened at Shasta Abbey in Mount Shasta, northern California, for the 14th Annual Western Buddhist Monastic Conference. The theme of this year’s gathering was Monastic Culture and Education, and from June 24-26, there were presentations and disucssions every morning, afternoon, and evening. Topics included “Approach to Requisites”, “Considering Monasticism,” “Creating the Western Dharma Monastery”, “Cultivating Seniority and Leadership Style”, and “How will Buddhism Fare in North America”, the concluding presentation by Ven. Bhikkhu Bodhi, who presented by phone. In addition, there were discussions on how Western Sanghas relate to their Asian origins and teachers, and a lively evening of musical sharing, including performances by the Shasta Abbey Choir, American Buddhist folk music from DM Sure, a rendition of “Star Spangled Compassion” from Sravasti Abbey, and Buddhist children’s songs from Deer Park Monastery. Participants also attended a morning meditation and a beautiful morning service, with organ playing, along with Shasta Abbey resident monastics. There was an overall feeling of greater trust and openness developing among the group after so many years of gathering. Each participant had the opportunity to learn how other Buddhist monastics practice and train new monastics, and what challenges they face. The issue of gender equality was focused upon as being a major factor for Buddhism to flourish in the West. Some of the nuns present expressed their pain at realizing that nuns were treated as second class citizens in their Asian tradition; there is an opportunity to change this when nuns start monasteries and monastic training programs in the West. We also learned some practices from other Buddhist monasteries which may be adapted to our own monastery. For example, Abhayagiri Monastery holds bi-weekly communal meetings where all the monastics express what they are grateful for, what they regret, and what they feel hurt about. 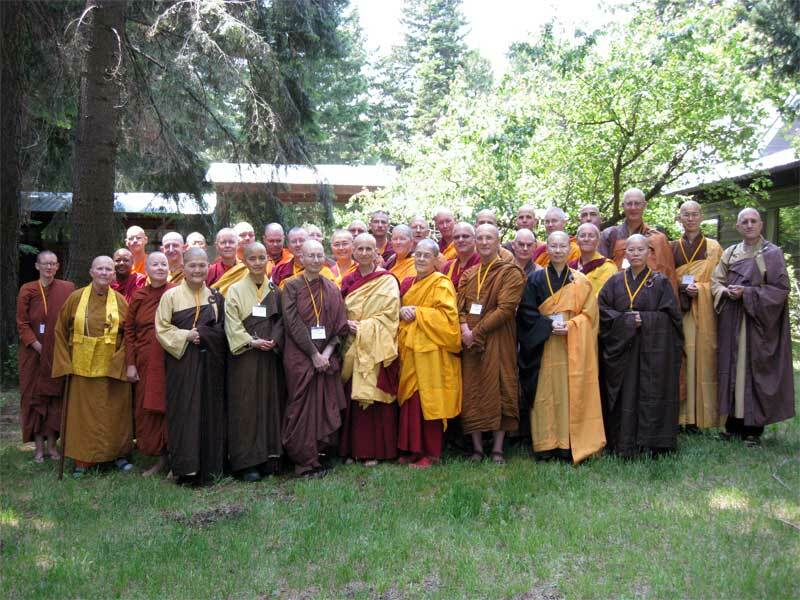 This opportunity to share feelings contributes to the harmony of the Sangha. Deer Park Monastery is completely solar-powered, and driving is discouraged. Lay disciples are encouraged to observe car-free days, and two electric vehicles provide transportation on campus. Most of the monastery’s vehicles run on vegetable oil, including recycled kitchen oil produced on site. Sravasti Abbey also follows many of these practices, avoiding driving as much as possible, and using cloth rather than plastic bags, for shopping. All the monasteries practice recycling, composting, and vegetarianism as well. Everyone agreed that the environmental destruction is a critical issue and voted the theme of next year’s conference to be “Monasticism and the Environment” (same as the Gethsemani III Retreat theme). 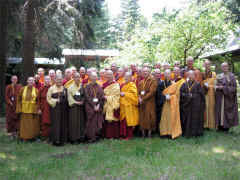 The conference will be held at the City of Ten Thousand Buddhas, tentatively scheduled for the second week of October.